A couple of our neighbors popped over the other night to see what we've done with the place. And one of them kept mentioning how much she loved our DVD display. Actually, upon seeing our condo for the first time, most people do tend to linger on that feature for quite a bit. 1) you can display them artfully. 2) or you can hide them in a media console. That's it. 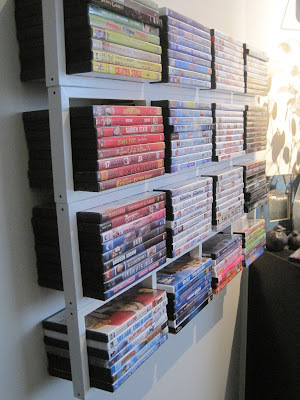 And flimsy DVD racks from Walmart don't count. The idea of arranging them by color came from Jackie- and it was a brilliant one at that. 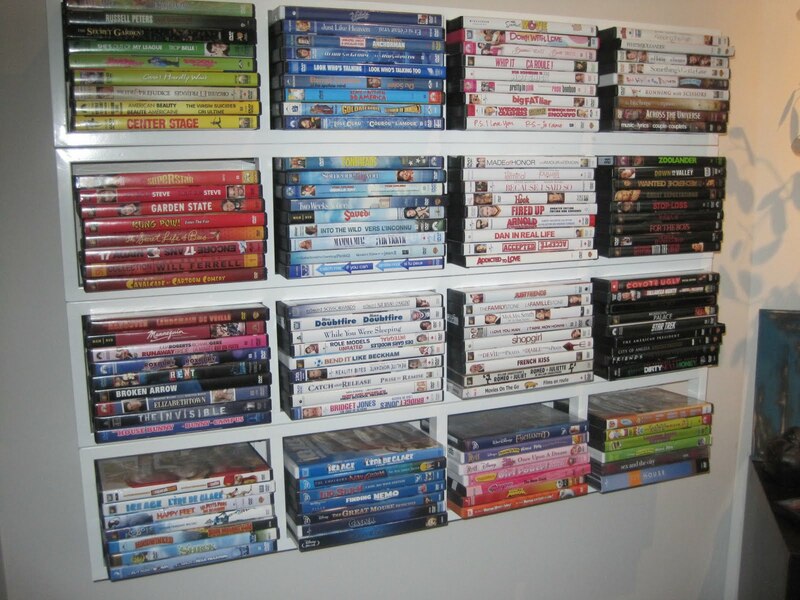 When you sit on the couch across from the shelving, all the DVDs blur to create a rainbow art piece. It also creates variety by mixing the discs up- and when it comes to choosing which movie to watch, you can make it into a game! : for example, you can pick a color (ex. red) and make the other person choose from the red movies only- And yes, we did try this game once or twice, but it became repetitive pretty quickly. ﻿Try arranging a group of objects in your home by grouping them according to color: assign a different colored book for every shelf on a bookcase, or arrange your CDs in a linear fashion to emulate a rainbow. It's a small little change that will make for big impact.